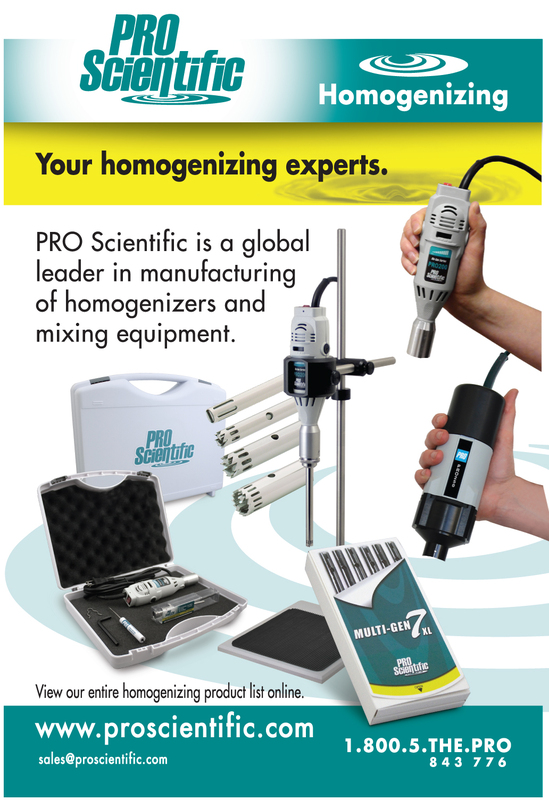 Laboratory Homogenizers from PRO Scientific are ideal general laboratory homogenizers. PRO Homogenizer Kits provide everything you need to begin homogenizing in your lab. Selection is conveniently based on your application. Our Laboratory Homogenizer Kits help you identify the necessary homogenizing equipment easier because they are process and/or volume range specific. PRO Hand Held Laboratory Homogenizers are high-quality handheld models that feature powerful watt motors, large RPM range, and separate on/off speed control. Both handheld models are lightweight enough to be hand-held but do have Stand Assembly options available. PRO Digital Laboratory Homogenizers that are post mounted on a stand assembly, consist of two models. SB-1 Silent Brushless Laboratory Homogenizer and PRO25D Digital Laboratory Homogenizer. Both models provide complete control of the RPM range within hundreds for exact speed awareness and speed fine-tuning. Process ability of all types of samples within micro-tubes to large beakers/containers. beating. We have PRO Quick Connect Generator Probes to process in tubes as small as .5ml and up to multi-liter processing and our Multi-Gen 7XL Multi-Sample Generator Probes easily process in tubes from 1.5ml-50ml. Automated Laboratory Homogenizers are perfect for researchers needing to homogenize/mix/blend a large number of samples per day. PRO Automated Laboratory Homogenizer Systems allow for many samples to be homogenized simultaneously and/or during one processing run period, which reduces researcher time and labor involved in homogenizing as well as provides consistent results and eliminates the risk of cross-contamination. PRO Automated Homogenizer Systems consists of two models, Multi-Prep Rapid Homogenizer and DPS-20 Dual Homogenizing System. Need help selecting a laboratory homogenizer?